Question: How can I say “No” and mean it? I often say “Yes” when I want to say “No.” I’m sure my childhood has something to do with this. I could never speak up and say what I really felt. I always had to do stuff out of duty and obligation. It sucked! Answer: The good news is you’re an adult and can say “No” and mean it. If the people in your life get mad or upset with you it’s their issue, not yours. To quote my law professor, “Too bad, so sad” which means it’s not your problem. 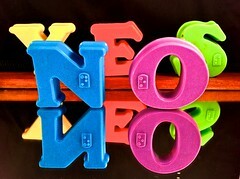 Many people say “Yes” when they want to say “No.” They say ‘Yes’ out of duty, obligation, or a sense of responsibility. Meanwhile they mumble under their breath as they bake cookies, cook a meal, drive a family member somewhere because they never learned how to drive, or whatever it is they agreed to do. Don’t be one of these people! You have every right to say “No” and mean it. The key is to be nice about it. There’s no reason to get snippy. Whenever you’re asked to do something, don’t do it because you feel you ‘have’ to. Simply say, “I’d love to help, but I can’t.” You don’t have to go into a lengthy explanation. Of course, if you’re going on vacation or will be out-of-town, you could mention it. Please don’t lie and say you’ll be out-of-town, when in fact, you won’t be. Lying is draining and unnecessary. Chances are you will get caught. I don’t want the responsibility of being a parent. I love my nieces and nephews and spend time with them, but I hear family and friends complain all of the time they can’t do this or that because they have kids. They get upset when no one volunteers to watch their kids or offers to watch them so they can go out for a nice dinner. Quite frankly, these people chose to have kids. Perhaps they should have thought about how much responsibility children are. I did. By the way, I have pets so I do have responsibility — I have ‘fur’ kids. Lol! Answer: Unfortunately, you can’t make anyone see your point-of-view. As long as you’re comfortable with your decision not to have children that’s all that matters. Don’t keep explaining ‘why’ you don’t want to have kids. Your family and friends won’t understand because your life is not theirs. Simply say, “It’s my life” and let it go. Your family may not believe this, but not every woman is meant to be a mother. You either have a deep calling to be a mom or you don’t. On the flip side, this doesn’t mean you wouldn’t make a great step-mom (if you wanted to) because chances are children split their time between mom and dad; unless, of course, dad has fully custody. It will behoove you to be open and honest with potential love interests when the subject of children comes up. If you have no desire to have children or even be a step-mom, speak up before you’re too deep into the relationship. It’s not fair to string someone along.